All single-cup coffeemakers and espressos reviewed on this site. The Cuisinart DCC-3000 Coffee Maker is a fully programmable coffee brewer for domestic use that delivers "coffee on demand". At least, that's what the main sales point is. And it does this without using a carafe. Plus, it uses coffee grinds, not K-cups or other capsules, so it's much cheaper to operate. It also boasts separate, removable water and coffee reservoirs that are easy to clean. And you can load the coffee reservoir with up to twelve 5-oz cups worth of grinds. There's no deterioration of taste or temperature if you want just one to four cups. Just use the 1-4 cups setting on the control panel. Talking of taste, there's a charcoal filter that fits neatly into the water tank to filter out impurities. So far so good. But does this popular coffee maker have any little secrets that you ought to know about? It delivers piping hot coffee with no loss of flavor long after it's finished brewing. One cup at a time for up to twelve cups of 5-oz. You can use larger mugs, over six inches tall, by simply removing the drip tray and plate. Twelve 5-oz cups is quite a lot of coffee grinds, right? So you'll want to keep an eye on how much you have left before you have to brew up again. A quirky looking gauge right above the coffee spout does that for you. At least, it's supposed to, and maybe it mostly does, but see below for more on that. Of course, you don't always want your coffee straight away. It's nice to have it ready and waiting for you when you wake up in the morning. No problem. You can program this brewer to swing into action up to 24 hours in advance. And no worries about forgetting to switch it off either. You can set it to do just that at any time from immediately after the last brew, to four hours later. Your coffee stays hot for a while after that, so no excuses for cold coffee. The DCC-3000 Coffee Maker even tells you when it's in need of a clean (how nice of it). It extracts all the flavor by having a showerhead that distributes the water evenly over the coffee. Your program settings are preserved for up to a minute if there's a temporary loss of power for any reason. And here's a nice touch - when you're pouring your coffee a light comes on so you can see what you're doing. Put simply, the DCC-3000 Coffee Maker brews coffee into a coffee reservoir for you to dispense whenever you want. The coffee reservoir is heated to 190 degrees (the optimum temperature for flavor extraction), so your coffee stays hot. How long it stays hot for is up to you via the programming on the control panel. But it does this in such a way that there's no loss of flavor, for up to four hours. That should be enough for one, or even two, people for a whole afternoon. All right, for a couple of hours then, but no less. It's easy to program it for a smaller quantity. Just press the "1-4" button on the control panel and place the lesser amount of grinds in the coffee reservoir. The DCC-3000 uses a Gold-Tone Cuisinart Commercial-Style Filter. You can use a paper filter if you prefer (you'll need a #4 cone filter). Keeping any coffee maker clean is so important that I've written a separate guide on it. Click here for "How To Clean A Coffee Maker". The Cuisinart DCC-3000 Coffee Maker needs particular care in keeping it clean. Apart from rinsing the permanent filter each day, rinse the basket it sits in. This may not seem dirty but it is susceptible to condensation. The coffee reservoir also needs an occasional rinse and regular emptying so it doesn't overflow on the next brew. Several users have reported a problem with the coffee reservoir. There have been occasions when it has leaked, or overflowed, for no apparent reason. It seems that sometimes coffee grime gets under the gasket in the coffee reservoir valve, so the valve can't close fully. You should be able to avoid any instance of this by carrying out a weekly cleaning routine. You can use coffee pot cleaner, though personally, I prefer a mixture of white vinegar and hot water. Swirl this around the coffee reservoir thoroughly while at the same time pressing the valve with your finger. Then rinse thoroughly with cold water. Other than that, a wipe of the exterior with a damp cloth is all that's required. Removable coffee reservoir (in inches): width 9.5, height 10.5, depth 3.0. What users of the Cuisinart DCC-3000 Coffee Maker like most is how it provides instant hot coffee time after time. They like the freshness of their brew even when it's just spent a couple of hours in the coffee reservoir. As of February 2019, the DCC-3000 has over 2,800 reviews on Amazon with an average rating of well over 4 stars. Some users have mentioned that the gauge doesn't work properly, and it seems this is an issue on some models. But even for people who experience this problem, it's not a deal breaker. They just have to keep a rough tally of how much coffee they have left in the coffee reservoir. The power cord can be rather difficult to pull out fully when you first unpack this brewer. However, it does extend to nearly 3 feet, which is long enough for any work top. I've mentioned the coffee reservoir valve, which can get stuck if not cleaned regularly. However, a little white vinegar and water, and a few minutes a week are all you need to avoid this problem. The Cuisinart DCC-3000 Coffee Maker is heavy duty and well made. The materials that it is constructed from and that come into contact with liquids are BPA free. It produces hot, delicious coffee that can be kept hot for up to four hours or more without losing flavor. There's no carafe or capsules to bother with, and you can easily program it up to 24 hours ahead. It's ideal for family use, and with the "1-4 cups" setting, it's also suitable for one or two people only. Cleaning is easy, with both reservoirs being easily removed. Cuisinart is an established manufacturer of high-quality coffee makers. We at ChooseACoffeeMaker.com can recommend their DCC-3000 coffee maker. "Our most advanced brewing system for large offices." That's how the Keurig B3000SE Coffee Maker and Espresso Machine is described by Keurig themselves. A coffee brewing system that is used by dozens, possibly hundreds, of people throughout the day has to be advanced. They all want different brews, in different strengths, with different flavors and in different amounts. And they don't want to have to go through a complex procedure to get it, either. So, against this considerable challenge, how does the Keurig B3000SE coffee maker measure up? Note: The Keurig B3000SE has been discontinued. You may still be able to purchase it, but new Keurig B3000SEs are now rare. Used products are available, which is why this review has been left in place. Keurig's B3000SE is designed and built for constant heavy use. The kind of use that only a large, busy office can provide. And if you've ever worked in such a place you'll know that people don't want to wait for their refreshment. They want it at the touch of no more than a couple of buttons. They want an intuitive interface so they don't have to think unduly. So they can seamlessly carry on talking with their colleagues about the latest office management techniques and other gossip. But they also want their exact choice of brew to taste good, and not have overtones of the previous brew. And they certainly don't want any interruptions for refilling the reservoir or anything else that could spoil their day. Can the Keurig B3000SE handle all of that? Let's see. It has an LCD display that is simple to use (more on that below), and it has speed. It uses regular K-Cups (not "my K-Cups" as it's a commercial machine), so there's no messing with actual grinds. The capsules are auto-ejected and every 35 to 40 brews the display alerts you to empty the bin. If you need more storage you can add a platform that takes another 70 empty capsules. You're also alerted if you forget to put your cup on the drip tray or a K-Cup pod in place. And if you want hot water only there's a separate dispenser for it. You can easily rinse the internal works clean of any vestige of the hot chocolate brewed by the previous user. And, finally, the coup de grace. The B3000SE is plumbed in to the main water supply. This does away with a reservoir and all its attendant cleaning and constant refilling. This coffee brewer can happily go on supplying coffee in all measures and from all kinds of K-Cup all day. Non-stop and without complaint or even much attention at all. That seems to have the "heavy duty" box ticked. Using the K-Cup capsules, the B3000SE can brew in sizes of 4-oz, 6-oz, 8-oz and 10-oz. The 4-oz is really for espressos or iced coffee. If you want a larger brew you can flip the drip tray and insert a mug of up to 20-oz. As for blend and taste, you are restricted to K-Cups. However, in an office environment this matters less than at home. And you still enjoy a choice of K-Cups that extends to over 200 coffee and tea varieties. And a dozen or so of the top coffee and tea brands. If that's not enough, you can set the brewing temperature to between 187 and 192 degrees, according to your preference. There's a separate hot water dispenser for when you need hot water for tea or some other beverage. You can get up to 10-oz at a time. It does make some noise when working, though only for a matter of seconds. Nothing that sounds out of place in a busy office. There's one final level of choice. If you're the boss, paying for office refreshments out of your own pocket, you'll like this. You can connect the B3000SE to a vending machine so users have to pay for their drinks. This setup can take both US and Canadian currencies, and increases prices in 5-cent units. An office machine like the Keurig B3000SE might be used by dozens of different people all the time. So it has to be simple to operate, and it is. The four buttons below the LCD screen are used to select from the choices presented. The LCD readout is inter-active and intuitive, and key to the simplicity of operating the machine. Even the language can be selected on setup from English, French and Spanish. Most users will just lift the brew handle, place their cup on the drip tray, put the K-Cup in place, close the handle, select their cup size and press the button. It's not only for selecting your drink. The LCD display also provides diagnostic messages when something's wrong, such as if the capsule bin needs emptying. And, of course, if 60 seconds is a long time to you, you can check progress on the LCD screen. Ease of cleaning is important in an office environment. As we've seen, there's no reservoir to clean. The outside of the B3000SE just needs a wipe with a damp cloth once in a while. The internal works should be regularly cleaned by running a measure of hot water only, and discarding it. You can remove the drip tray very easily for cleaning. The filter should be replaced at least every six months. Descaling should be carried out regularly, using 80-oz of descaling solution. Some users simply do a regular brew with vinegar and water and find that works perfectly well. As for servicing, if you regularly purchase your K-Cups from a dealer then he will probably be happy to service your machine free of charge. Worth checking out. Keurig is one of the leading coffee maker manufacturers and have been named the coffee maker "Brand of the Year" for all five years from 2012 to 2016 by the Harris Poll EquiTrend® Equity Study. You can read more about them in our review of the Keurig K45 here. At the present time there are less than 40 reviews of the Keurig B3000SE coffee maker on Amazon. They give an average score in excess of 4 out of 5 stars, with over 70 per cent giving four or five stars. Many reviewers love how it functions non-stop with hardly any attention required. That's largely down to having it plumbed in to the main water supply, and no reservoir to worry about. The ease of use and lack of mess is also appreciated. The used capsules just fall into the bin by themselves at the end of the brew. Some users complain that they don't seem to have all the parts they need to install it. That underlines the fact that you need a plumber to set up this coffee maker properly. The instructions also leave something to be desired, but if you employ a plumber then you won't need them. All in all, most users of the Keurig B3000SE are very happy with their purchase. The Keurig B3000SE is a heavy duty coffee maker for use in a busy office or reception area. It's not for domestic use unless you want another device plumbed into your domestic water supply. It is easy to use, and cuts out the mess often associated with K-Cup machines. You really do need a plumber to set it up, but once that's done then maintenance is very easy. So if you need to keep your workforce happy and/or impress commercial visitors, the Keurig B3000SE coffee maker is an extremely good choice. The C60 and D60 versions of the Nespresso Pixie Espresso Maker are basically the same machine. The only differences are cosmetic. The C60 has ribs on the side and has a round, fat spout. The D60 has no ribs and has a thin, tubular spout. The colors are different. The C60 comes in a choice of titan or brown, whereas you can have the D60 in blue, green, aluminum, silver or various shades of red. What we'll do in this review is to treat them as one product, which, apart from the above differences, they are. Note: Both the C60 and D60 have now been discontinued. You may still be able to purchase them, but new C60s and D60s are now rare. Used products are available online if you look hard enough, which is why this review has been left in place. How Fast? Easy to Clean? One of the most surprising things about the Nespresso Pixie Espresso Maker C60 and D60 is how small it is. It's only just over nine inches tall, with a length of less than 13 inches and width of just 4.33 inches. But what it lacks in size it makes up for in style and performance. Nespresso have hidden the water reservoir round the back of it, leaving the handle and front piece as the main visible features. They've cleverly hidden the drip tray inside the machine, with a funnel directing spills into it from underneath the cup ledge. 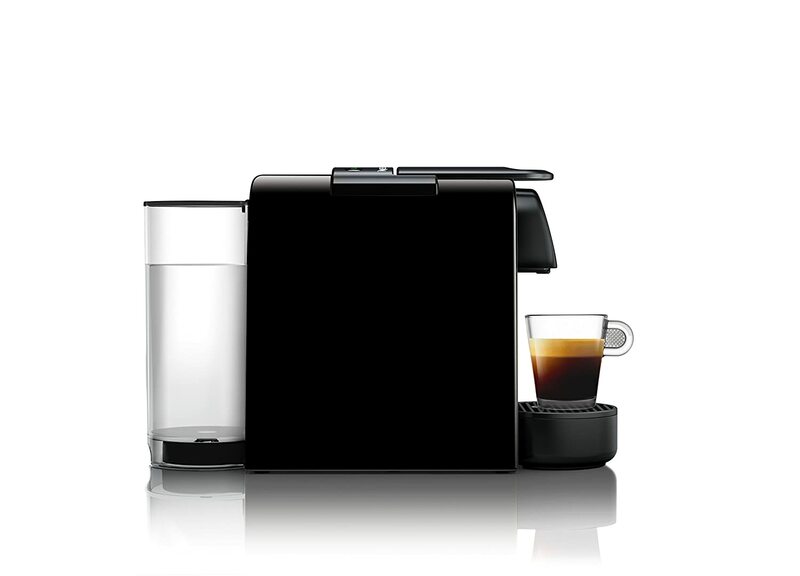 The Nespresso Pixie Espresso Maker C60 / D60 is about as user friendly as it's possible to get. It's a single serve machine and caters for almost any sized cup or mug. You can control how much water you want it to dispense and how strong you want your drink, so you get a consistent cup of coffee every time. But you can also vary any single serving by holding down one of the buttons on the back, for example to make a lungo (or larger drink with more water). Backlights on the controls indicate what stage has been reached in the brew cycle, and it's easy to detect the water level in the reservoir. There's a container inside the machine into which used capsules drop automatically, and there's even a little storage space to keep the power cord when not in use. To top it all, you have auto shut-off in case you forget to switch off before retiring for the night or going out. If it's speed you're after you won't be disappointed. The Nespresso Pixie Espresso Maker C60 / D60 can hold its own against much larger and more powerful-looking coffee makers. Each brew is ready in 25 to 30 seconds. Incredibly fast. Catering for a large family or guests shouldn't present too much of a problem as the water reservoir holds 24 ounces. And Can It Be Cleaned Easily? Nespresso supply a cleaning kit with full instructions, so cleaning is straightforward, and actually easier than with most coffee makers. You simply run it without putting any pods in. You can remove and rinse the folding drip tray very easily, and that will be the bulk of the cleaning required for the C60 / D60. Nothing beats, though, actually getting inside the machine (as far as you can) with the cleaning kit, and Nespresso recommend that you do this periodically to keep your espresso maker in top condition. It's hard to find anyone with anything but praise for the sheer good taste of the coffee this espresso maker produces. 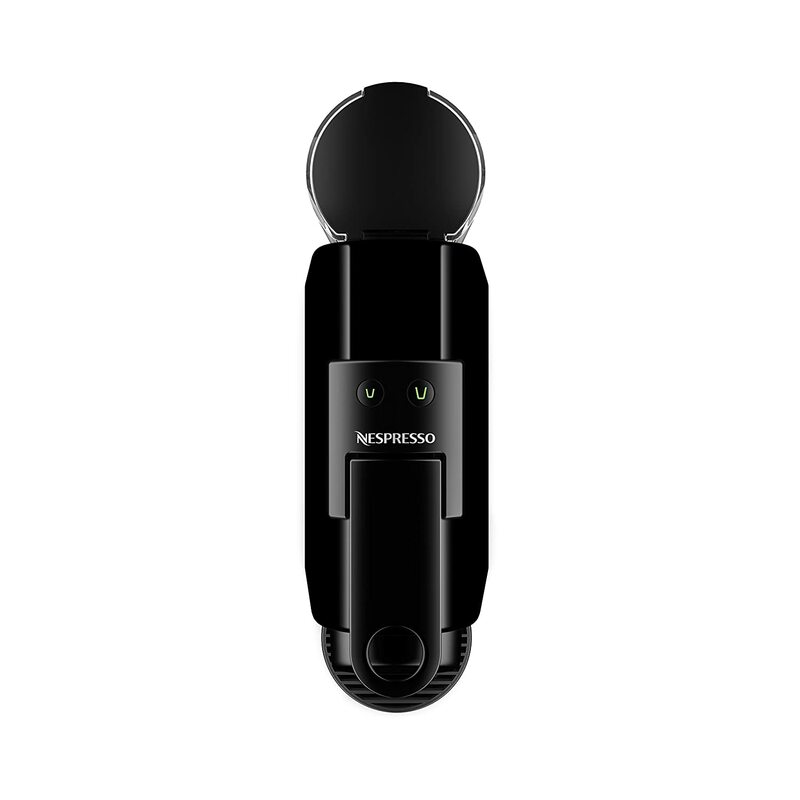 It comes with a set of pods so you can select your favorites before ordering more. They average around 65c each, but there's a large choice and you can get the best deals online. If you're environmentally concerned then you can easily re-cycle them. The C60 has nearly 600 reviews on Amazon at the time of writing and scores an average of over 4.5 stars. The D60 has around 130 reviews and scores a little lower. As you'd expect, there's nothing much between them in the figures, and the reviews themselves largely say the same things, being mainly praise for how versatile and reliable they are. These models haven't suited everyone, of course (it would be rather surprising if they did) but negative comments are largely down to individual taste. One or two have mentioned the noise, but others describe these products as "whisper quiet", and what noise there is only lasts a few seconds anyway. 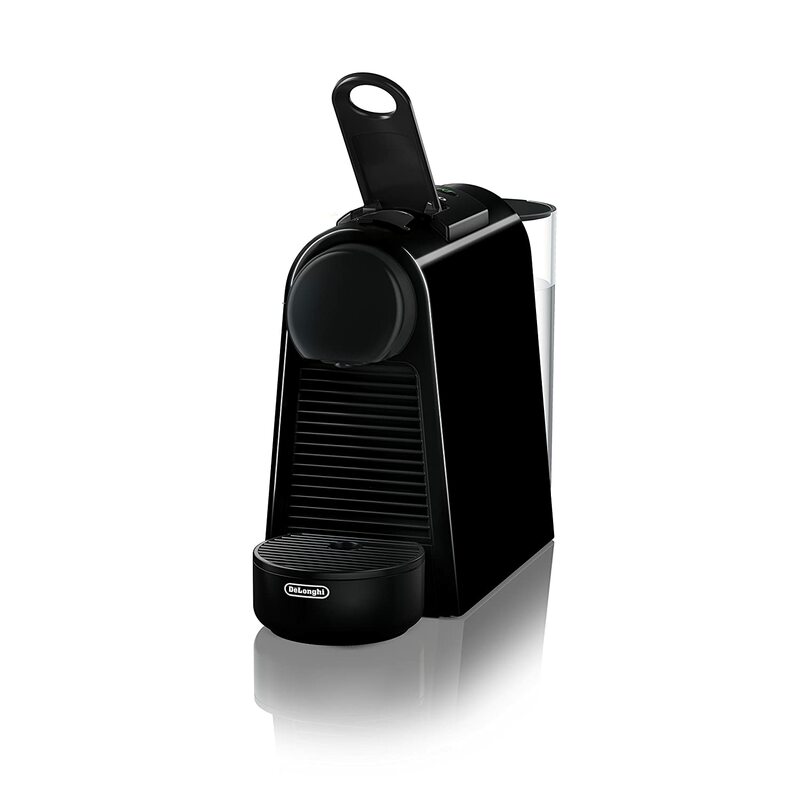 It's safe to say that most users are delighted with their Nespresso C60 or D60. Whether you opt for the ribbed C60 with its round, fat spout, or the D60, without ribs and with its thin spout, you're bound to be pleased with your purchase. The Nespresso C60 / D60 Pixie Espresso Maker represents good value for money and is backed by Nespresso's formidable reputation for producing high quality espresso makers. 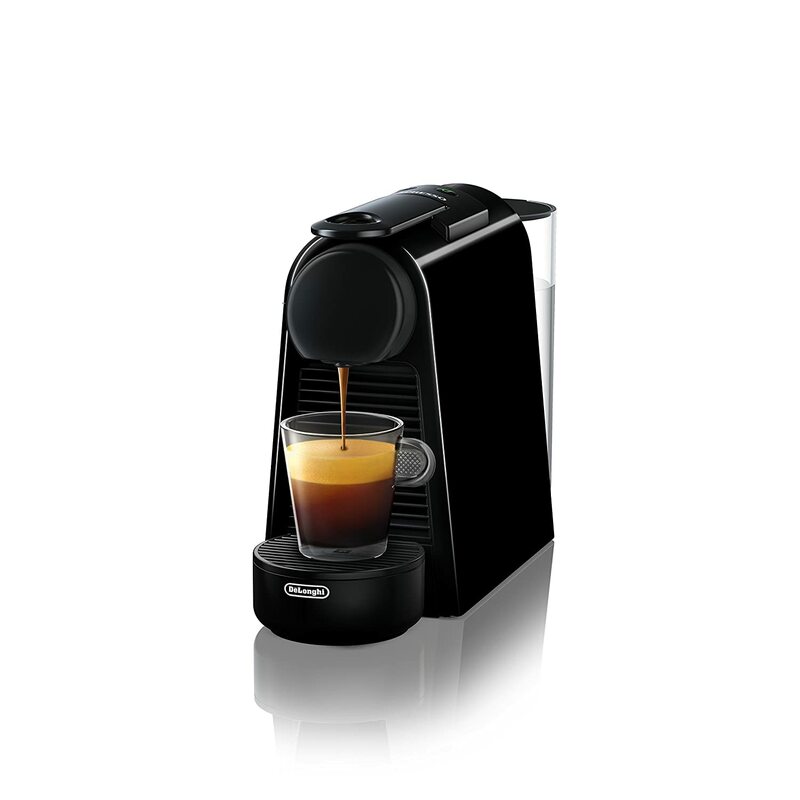 Click here to buy the Nespresso C60. 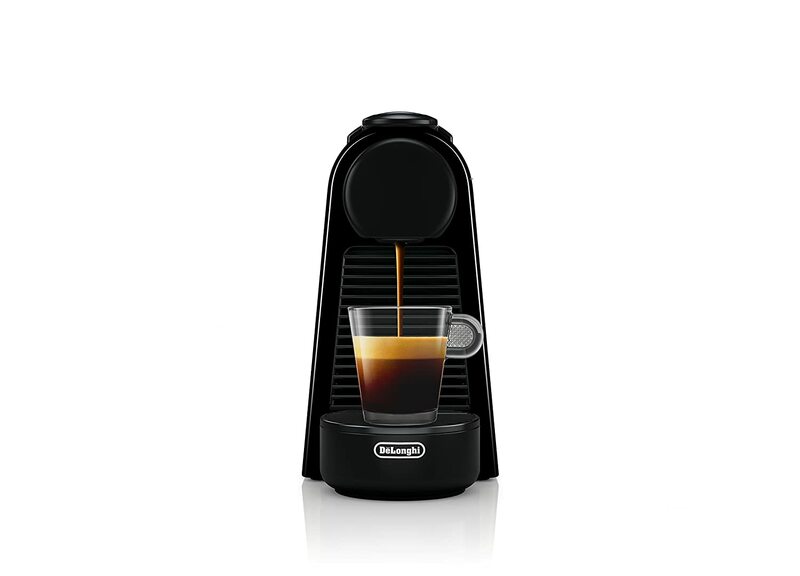 Click here to buy the Nespresso D60. The Keurig K75 Platinum Brewing System is an illustration of the fact that, by and large, you get what you pay for. This coffee maker is at the high end of the price scale, but when you unpack it and stand it on your kitchen table you'll know that you're looking at sheer quality. The heavy duty nature of this product means that it is suitable for use in an office environment as well as at home, so whatever your domestic situation it will comfortably provide a quality service to all your friends and family. Note: Sadly, this product has now been discontinued. You may still be able to purchase it, though probably only as second-user, which is why this review has been left in place. A review of its replacement will be available on this site by the end of March 2019 and a link to it will be placed here. The Keurig K75 will look good in your kitchen. Of that there can be no doubt. The sleek, super-sized reservoir extends stylishly over the top of the drip tray, and the back-lit LCD display shows the time, auto-off settings, cup size selected and brew temperature. Below the display are just four buttons that belie the amount of control you have at your disposal. Access the menu with the comfortably sized button of that name, and use the two side buttons to make your selection. Then one press of the brew button just below does the rest. With a massive 72 ounce water reservoir and the ability to brew a tad under 4, 6, 8, 10 and 12 oz cups, the Keurig K75 offers you control and adaptability. The drip tray, as you would expect, can be removed to accommodate a travel mug when required. You can also control the brew temperature, thanks to the Quiet Brew Technology® of Keurig. And the Auto On/Off Energy Savings Mode means you won't be paying over the odds for the power consumption. If you use a separate water filter such as a Brita then you have the option of removing the K75's water filter if you prefer, or the period between replacements can be extended. The purer the water you use then, generally, the longer your coffee maker will last. But here's a tip. Don't skimp on renewing the filters. You can't make the supplied water filter last forever by filtering your water separately before filtering it again in the reservoir. Over time, the charcoal in the filter will break down (not a design fault - just the laws of physics) and you may find little grains of it get into your coffee. Perfectly harmless, but it may affect the taste. And here's another one. If you find your K75 scales up too quickly then try using distilled water and marvel at the difference. Thanks to one of the reviewers for that one. Pros: Suitable for home or office; massive 72-oz water reservoir; travel mug option; brew temperature control; auto on-off. Cons: Filters need replacing regularly if you want to preserve the taste (or you could use filtered water to extend their life). This product scores an average of well over 4 stars from around 1,340 reviews on Amazon at the time of writing, which is exceptionally good. The immediately noticeable trend is that the vast bulk of coffee maker reviews give a full five stars. Many reviewers enthuse about the K75's good looks, speed, and ease of use. Some negative reviewers have picked up on the fact that it apparently only heats to 170 degrees and not 192, the recommended temperature for coffee. But there is some uncertainty as to whether they are measuring the temperature of the coffee once it has settled in the cup or that of the top of the stream coming out of the unit (which is the correct place to measure from). So don't be put off too easily by people who may be using the wrong criteria to judge the product. Keurig is a name associated with high-quality coffeemakers, and the K75 is at the high end of its price range because it is one of their best and most reliable machines. This coffeemaker has thousands of fans and the overall rate of satisfaction is very high. I have no difficulty in recommending the Keurig K75.